The EU’s appointments of the Belgian prime minister Herman van Rompuy (what comical names these foreigners do have!) as permanent Chairman (“President”) of the European Council, and (subject to the approval of the European parliament) of the EU’s (British) Commissioner for Trade, Baroness (Cathy) Ashton, as High Representative for Foreign Affairs and Security Policy and Vice-President of the European Commission, are both, on the evidence, imaginative and sound. Van Rompuy has a solid reputation for his skill in negotiating compromises and accommodations between the warring Flemish and Walloon communities in Belgium, exactly the skill required for steering the 27 egos of the European Council towards the compromises and accommodations that are essential if the Union is to speak with one voice on deeply controversial and divisive issues. Moreover van Rompuy’s low-profile and unassuming manner is an asset if the 27 heads of state and government who comprise the Council are not to feel their status as elected national leaders threatened by a more flamboyant and assertive Chairman with ambitions to cut a figure on the world stage. Cathy Ashton has won golden opinions, respect and even affection in Brussels and beyond during her year as EU Commissioner for Trade, one of the most demanding jobs in Europe. The opportunities for identifiable personal triumphs in that role are naturally limited — much of the work is dismayingly technical and has to be conducted discreetly behind closed doors, and success often depends on the decisions of foreign governments over which the Commissioner has no control — but despite this she already, in just 14 months, has a respectable list of achievements to her name. Her unprepared statement on her new appointment struck exactly the right note of firmness, efficiency and modesty. Belgium’s Prime Minister Herman Van Rompuy has been named new EU president. Devoid of patriotism and contemptuous of democracy, Herman Van Rompuy perfectly embodies the culture of the EU. His sole political ideal is the creation of a federal superstate, destroying national identities across Europe. A Belgian federalist and a former chairwoman of Hertfordshire Health Authority were ushered into Europe’s two grandest jobs last night as it stumbled on to the world stage. — shouted the lead story on the front page of the print edition, although interestingly the headline was changed in the online version to a more sober “Herman Van Rompuy and Lady Ashton chosen to lead EU“, no doubt amended when Alan Rusbridger choked on his cornflakes over the ‘great EU stitch-up’ headline. There’s no mystery about these dreary media distortions. Most of our print media are hysterically Europhobic, and incapable of printing anything positive or even straightforwardly factual about the EU. For months they have been building up the notion that Tony Blair was in with a chance for European Council ‘President’, when anyone with an ounce of political nous knew very well that such an idea was beyond satire. So the appointment of a Belgian with a funny name had to be represented as a snub to Britain, and Lady Ashton’s appointment as apologetic compensation. Even worse, the fatuous idea that Blair might be appointed encouraged a gross misrepresentation of the job as “President of Europe”, misreading ‘President’ to imply an executive President, to be on a par with President Obama and the President of China, instead of the title of President being merely the French for ‘Chairman’. Sweden, as current EU Presidency, circulated a paper to the Council before the appointments were discussed and agreed, designed to stress that the principal function of the President would be to chair, steer and manage the meetings of the European Council. Clearly Tony Blair’s ambition was a good deal grander than that. Two other distortions are worth noting. Almost all UK media coverage has harped on the ‘obscurity’ of the two appointees, sneering that no-one had ever heard of them. It’s of course true that neither van Rompuy nor Cathy Ashton are household names in Britain, or even probably elsewhere in Europe. But this trumpeted obscurity is partly a function of the failure of the UK media to report day-to-day news of the EU or of individual continental European countries unless they either touch on some argument with Britain, or make the mainland Europeans concerned look ridiculous and therefore funny, or demonstrate the rottenness of the EU and the general incompetence of foreigners. Van Rompuy after all has been prime minister of Belgium since 30 December 2008 at a time when a close European neighbour and host to the EU’s institutions has been passing through a major constitutional and political crisis; Lady Ashton has for more than a year occupied one of the most demanding and difficult positions in the whole EU with considerable flair and success, and was formerly a member of the UK Cabinet and Leader of the House of Lords who steered the controversial Lisbon Treaty through the House of Lords with conspicuous skill. 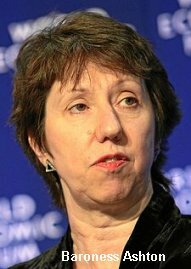 It’s true that she is a former Chair of Hertfordshire Health Authority: but then it’s not so long ago that Barack Obama was a community organiser in Chicago, a more obscure position than almost anything Lady Ashton has ever done. Nor has Cathy Ashton’s work in UK politics gone unrecognised: in 2005 she was voted “Minister of the Year” by the parliamentarians’ own house organ, The House Magazine, and “Peer of the Year” by Channel 4. In 2006 she won the “Politician of the Year” award at the annual Stonewall Awards, awarded to those that have made a positive impact on the lives of British LGBT (Lesbian, Gay, Bisexual and Transgender) people. (A wonder the Daily Mail hasn’t yet picked that one up as fodder for another sneer.) In several of her UK ministerial jobs and especially as EU trade commissioner, she has acquired quite extensive experience of international negotiations, useful preparation for her new role. But the other distortion is more significant. The consultation process within the European Council leading up to the unanimous agreement on the two appointments has been widely denounced by our media as a ‘stitch-up’, seamy horse-trading, and worse. Those proclaiming the greatest outrage over the process have tended to be the loudest opponents of so-called EU ‘federalism’, term misused to mean a propensity for the EU to turn itself into a single centralised supra-national super-state. Some have even denounced the appointments as undemocratic because we, the people of Europe, were denied the opportunity to vote on who should hold these important posts. Yet if there had been any question of holding Europe-wide elections to the posts of “President of Europe” and “Europe’s Foreign Minister” (to adopt the media’s nursery-language abbreviations) , that would unquestionably have prompted a storm of Europhobic invective at this new evidence of Britain being dragged unwillingly into a European super-state. A European Council President (and to an only slightly lesser extent a High Representative for Foreign Affairs and Security Policy) with the unique authority derived from having been elected from right across Europe would have outshone the 27 nationally elected heads of state and government who at present exercise overall control of the Union’s affairs, and are responsible each to his or her national parliament and electorate for what they do. Direct election to the Council Presidency would indeed have marked a decisive step towards a supra-national sovereign EU. But our Europhobic newspaper proprietors and their obedient leader-writers had no qualms, apparently, about using even this as a stick with which to beat the leaders of our continent and the union of independent sovereign states to which we belong — just. Tailpiece: Returning for a moment to the richly comic Blair bid for “the Presidency of Europe” (not): I described in an earlier post on this blog (here) my abortive attempt to persuade the Guardian to correct its erroneous descriptions of Mr Blair’s middle east job as “Middle East peace envoy” in one place and “UN envoy in the Middle East” in another, when in fact he is neither. In its eventual, long-delayed reply, the Guardian admitted that “UN envoy” was wrong, but tried to argue that “peace envoy” was a defensible description, and accordingly declined to publish a correction. In my response to this I cited conclusive evidence that the Quartet, which had appointed Blair, had been at pains to ensure that he was kept well away from the peace process, on which the United States took the lead. Predictably, perhaps, the Guardian has ignored this; anyway, by now it’s oldish hat. But in the wildly improbable event of Blair having being taken seriously as a candidate for European Council President, the extent and character of his middle east appointment could have assumed some significance. I will put the evidence for the limited scope of Mr Blair’s middle east job in a further post on this blog soon. Watch this space. For the avoidance of doubt, and in view of an anxious enquiry from an old friend, I apparently need to point out that my reference to the “funny names” that some foreigners have is a dig at the chauvinists of the Sun and other tabloids who entertain their readers by making jokes of foreign-sounding names, apparently unaware of how comical many of us (often including our names) seem to foreigners. Brian writes: John, that’s an intriguing (and pithy) question. It seems highly unlikely that either (a) Gordon Brown thought there was any chance of Blair being chosen as President of the European Council, or (b) he really liked the idea of his old adversary, the usurper, lording it over him all over again at every European Council meeting — although the thought of David Cameron as UK prime minister having to submit to Tony Blair as chairman of European Council meetings could have been tempting. So why did Brown go through the motions of campaigning for Blair for President? Well, once Blair had launched his unofficial campaign, with Jonathan Powell running round Europe lobbying for him, Brown would have looked vengeful, petty-minded and unpatriotic if he had refrained from publicly backing him: so he would have felt that he had to go through the motions. Then Brown may have calculated that Blair was bound to lose the nomination for President, and that this apparent ‘snub’ to Britain might cause the rest of the EU heads of government to feel that a Brit should be given the High Representative job as a consolation prize: they are all presumably pretty apprehensive about the prospect of a deeply Eurosceptic Cameron/Hague government taking its place in the EU Councils some time next May, and some of them at least probably wouldn’t have wanted to aggravate that future UK government’s suspicion of the EU by sending the UK away from the appointments session empty-handed. They may have thought that having a Brit as High Representative might help to lock Britain slightly more firmly into Europe. (Barroso, one of the other Presidents and the most powerful of the three, went out of his way after the appointments had been announced to stress how much the EU valued Britain’s membership, even if that may not be the universal view in Europe.) Another factor, given the bad blood that had existed for all those years between Brown and Blair, might even have been a certain Brown schadenfreude at the thought of Blair failing to win the nomination and not being able to blame Brown for the failure, Brown having publicly made clear his backing. Or it might have been a combination of all these factors. The short point is that once Blair had thrown his moth-eaten hat into the ring, Brown really had no option but to proclaim his support for him, whatever his real feelings and however sceptical he must have been about Blair’s chance of success. Whilst agreeing with Brian that the media coverage here has for the most part been petty and ill-informed, his praise for the virtually unknown and never elected Baroness Ashton is surely overblown. The appointment of Van Rompuy as Chairman may indeed be appropriate to the limited job description of his role but the same can not be said for Cathy Ashton. The title of High Representative in itself suggests a need for a person of stature who can command respect on the international stage and within the EU Foreign Ministries alike. She was, we are led to believe, the UK’s fourth choice for the post after Messers Milliband, Mandelson and (Heaven preserve us) Geoff Hoon. She has no diplomatic experience and will have a hard task to be taken seriously. Her appointment is indicative of the fudge which characterises so much of the way in which the EU conducts its business without any regard to the wishes or possible democratic involvement of the citizens of the member states. On these grounds the media have some reason for disillusionment. Brian writes: Jeremy, on this occasion I have to disagree with almost everything you say. Just to recap: Cathy Ashton has a degree in economics and a BSc in sociology from London University. From 1983 she worked for the Central Council for Education and Training in Social Work. From 1983 to 1989 she was Director of Business in the Community, working with business to tackle inequality, and established the Employers’ Forum on Disability, Opportunity Now, and the Windsor Fellowship. For most of the 1990s, she worked as a freelance policy adviser. She chaired the Health Authority in Hertfordshire from 1998 to 2001, and her children’s school governing body, and became a Vice President of the National Council for One Parent Families. She was made a life peer in 1999. In June 2001 she was appointed Parliamentary Under-Secretary of State in the Department for Education and Skills. In 2002 she became minister for Sure Start in the same department. In September 2004, she became Parliamentary Under-Secretary in the Department for Constitutional Affairs. She was appointed a Privy Councillor in 2006, and became Parliamentary Under-Secretary of State at the Ministry of Justice in May 2007. In 2005 she was voted “Minister of the Year” by The House Magazine and “Peer of the Year” by Channel 4. In 2006 she won the “Politician of the Year” award at the annual Stonewall Awards. In June 2007 she was promoted to the Cabinet as Leader of the House of Lords and Lord President of the Council. As Leader of the House, she was responsible for steering the Lisbon Treaty through the House of Lords. On 3 October 2008, she became the UK’s European Commissioner in Brussels and her appointment to the key post of Commissioner for Trade was approved after the nomination hearings by the European parliament. During her 14 months as Trade Commissioner, one of the most high-profile jobs in the EU, she has won great respect and golden opinions. To say that she’s “virtually unknown” after she has been a minister and cabinet minister and a senior EU Commissioner without interruption since 2001 suggests a new and unfamiliar definition of “unknown”. Perhaps you would regard her appointment as appropriate if she had been a winner in The X Factor, Britain’s Got Talent, Strictly Come Dancing and Get Me Out of Here, I’m a Celebrity? Let’s not confuse celebrity with political, parliamentary, ministerial and bureaucratic prominence. Similarly, to assert that “she has no diplomatic experience” implies an extraordinarily narrow conception of ‘diplomacy’: Lady Ashton has extensive experience of difficult and sensitive negotiatons in a wide range of fields and is a proven persuader, especially as the EU’s trade commissioner, but also in her various ministerial roles. How many recent British foreign secretaries had “diplomatic experience” before their appoiontments to the FCO, apart from Douglas Hurd? Ashton will not be the foreign minister in the government of an independent sovereign state like David Miliband or Hillary Clinton: she will help to formulate by persuasion and negotiation a common foreign policy agreed by 27 sovereign governments on some but by no means all international issues and then represent all 27 governments in the EU’s relations with the outside world. The fact that she has never held an elective office, to which you and other critics refer, seems to me to reflect a complete misunderstanding of what her role will be: it’s quite simply irrelevant. The EU has for decades had a body of diplomats representing it abroad in the form of EU Delegates and their (often impressive) staffs: Lady Ashton will now be responsible for developing this into a more cohesive diplomatic service. For all these tasks her wide-ranging experience qualifies her exceptionally well. PS: A great deal of the media sneering at these two appointments is self-evidently coloured by a chauvinist and shameful contempt for all Belgians, in the case of the Council Presidency, and barely concealed sexism in the case of Lady Ashton. But I have known and respected you well enough and long enough to be sure that you at least are completely innocent of any such unworthy prejudices. Methinks Brian protesteth too much. CathyAshton is obviously no slouch but surely noone can claim that she is well known outside very limited bureaucratic circles. Incidentally she was not the Head of Business in the Community. That position was filled with distinction by Julia (now Dame) Cleverdon, a woman with very considerable skills and intellect. Ashton was a subordinate, being Director of Public Relations at BITC. Despite the sarcastic dig about ‘Get me out of Here, I’m a Celbrity? etc, the fact is that Cathy Ashton does not command widespread respect either inside Britain or anywhere else beyond the inner ranks of the Labour Party and Brussels. The Uk may have been ‘rewarded’ with the second prize as recompense for Blair not being chosen as President and in the hope it might help to lock in a Eurosceptic Cameron government but the fact that Lady Ashton was accepted as High Representative despite being the UK’s fourth choice candidate, and a relative nonentityon the international stage at that, still to my mind represents a degree of fudge. I do, however agree that what matters is whether she has the ability and experience of international negotiation – just 13 months as a Commissioner is little enough preparation – to enable her to represent the whole EU effectively and to develop a cohesive EU diplomatic Service.Time alone will tell. As for political legitimacy my concern remains that to agree to accept for the post of High Representative a little known peer who has never been elected to office of any kind shows little respect for the democratic process. There was much disquiet at the elevation of Gordon Brown to be PM without election, even within Labour ranks. The problem is that political elites often prefer to avoid the potential embarrassment of submitting themselves or their nominees to public scrutiny. Unfortunately the EU is widely perceived as operating on the basis of a largely unaccountable bureaucracy and buggin’s turn. These appointments can only enhance that perception. I fear we shall just have to agree to disgree! Brian writes: Jeremy, I’m still baffled by your description of the Commissioner for Trade of the European Union, holding perhaps one of the two or three most demanding portfolios of the whole Commission, and a former UK Cabinet minister, as “a relative nonentity on the international stage”. I’m equally puzzled by your assertion that Lady Ashton’s appointment “shows little respect for the democratic process” and that it reflects the political élites’ (who they?) “potential embarrassment of submitting … their nominees to public scrutiny,” when Cathy Ashdown’s nomination to the new foreign affairs post is subject to the approval of the elected European Parliament, which will interrogate her and debate her qualifications before deciding whether to approve her appointment — which is more than what happens when the UK prime minister nominates a new foreign secretary, or indeed any other minister! But I agree that on all these matters we must just agree to disagree. Thank you for the reference. I have suggested that the Labour Party backed Blair so strongly in the hope that his success might take the heat off his appearance before the Chilcot enquiry; that would at least explain the frenzied nature of the support in parts of the Labour Party and media that seemed to have no need to back him fervently or at all. If this was the case (and it is pure speculation on my part that I have seen nowhere else), it shows a disastrous misreading of the situation. In fact the situation was the reverse: Chilcot doomed any slight lingering support that Blair had. But I fear that national arrogance may have won out over realism. Brian writes: Peter, thanks for this. My impression — that support for Blair’s doomed candidature came almost exclusively from Gordon Brown rather than from any significant element in the Labour party, much of which was adamantly opposed to it — evidently differed from yours. I feel sure that the prospect of Blair appearing before the Chilcot inquiry to defend himself against the charge of having committed a war crime was indeed the last nail in the coffin of his candidature; I don’t think that anyone would have supposed that appointment as President/chairman of the European Council, in the inconceivable event of that taking place, would have “taken the heat off him” in the Iraq inquiry, indeed, it could only have increased the indignity and embarrassment of the occasion for him. My speculative view of the reasons for Brown’s (at best lukewarm) support for Blair are set out above at http://www.barder.com/2191#comment-90545. I won’t insist on my idea, and you know more than I could ever wish to know about the internal workings of the Labour Party. It was just something that occurred to me as I wondered why they were so spectacularly going out on a limb for Blair. I can’t help thinking the answer to my question is less complicated than you suggest. But my opinion of Mr Brown has always been less charitable than yours. I seem to remember Mr Miliband also telling us what a splendid president Mr Blair would make. Or do you think he was lying as well? Brian writes: (a) D Miliband is a confirmed Blairite, or was; (b) he clearly had no intention of being frog-marched out of UK politics and into the EU just when the political outlook for him at home was becoming rather hopeful; and (c) even though he must have known that Blair’s chances of getting the European Council Presidency were remote, he will have reckoned that it would do no harm to talk them up, since if Blair got the Presidency, there would be no question of Miliband getting the High Representative job or even being put under pressure to take it, since there could be no question of any one country getting both jobs. I don’t see where ‘lying’ comes into it. It’s just elementary politics, which — contrary to current cynical assumptions — isn’t the same thing as lying. The media reports have puzzled me slightly – but will provide good fodder for tutorial discussions. Thanks, Brian. For my part, I can’t help feeling that the 27 member states, if they weren’t going for a politician, could have found someone eminently more qualified for the foreign affairs post. Surely, an experienced diplomat hovering around permanent undersecretary rank, with experience in Brussels and/or at the Commission, could have been found? Brian writes: Thanks, Julian. More evidence that the media in continental Europe can be just as obtuse and prejudiced as the UK’s! To call the prime minister of a founder member state of the EU and the EU Commissioner for Trade “obscure personalities” seems to me to stretch the meaning of words well past breaking-point. Of course it’s easy to think of alternative candidates with different qualifications for the foreign affairs post, but that doesn’t mean that the person chosen is any less qualified. A retired or serving diplomat would surely rank as much more “obscure” than an EU Commissioner who had been a UK Cabinet Minister. How well known were (for example) Condoleezza Rice and Henry Kissinger when they were plucked from academic life and appointed to senior government posts in international affairs without a fraction of the experience in both national parliament and government that Cathy Ashton has got — not to mention her experience of work at the heart of the EU? http://blogs.euobserver.com/foa/2009/11/24/why-the-commentariat-is-wrong-on-ashton/ (hat-tip: Lavengro in Spain, who pointed it out to me). The High Representative will obviously have to deal with pressing immediate problems such as Iran, and relations also with Russia (which directly affect energy policy). But the most important thing that she will have to do will be to set up the EU’s foreign service, which will have 7,000 officials and a budget up to 2013 of €50 bn. That is political and administrative work, not superstar limelight-seeking. According to Javier Solana it will be ‘the biggest diplomatic network in the world’. Brian writes: Peter, thank you for this timely reminder of one of the High Representative’s most important functions. The EU has of course had a network of overseas representatives, indistinguishable in practice from ambassadors but with the title of Delegate, each with a (usually modest) staff. In my experience many of these have been highly effective, others rather less so. (But the same could just as well be said of the national diplomatic services of many countries, including that of the UK.) I have to say, though, that I’m far from sure what this new and vastly expanded external affairs service of the EU is actually going to do to justify its existence. It will be some years before the EU can truthfully claim to have an agreed joint foreign policy line on all the major issues in international affairs. I suspect that the diplomats of the bigger EU countries will be reluctant to cede the leading role in conducting their countries’ foreign policies overseas to an EU ‘ambassador’ (or whatever Delegates are henceforth to be called). I also wonder whether the system of rotating presidencies whereby in each country the ambassador (or High Commissioner) of the country holding the EU presidency for that half-year chairs the local meetings of EU ambassadors will continue, as it is to do for all Council of Ministers meetings except the European Council itself, or whether the EU ambassador or Delegate in each capital will automatically become the permanent chair of such meetings. Having myself attended scores of these meetings (and chaired a good number during each UK presidency), I can testify to their importance and to the significance of who chairs them, anyway for the EU diplomats concerned and often more widely, since such meetings are an important source of information, assessments and policy recommendations flowing to EU governments and to the EU ministerial Councils and the Commission — including, hitherto, Javier Solana, and henceforth to Cathy Ashton and her staff in Brussels. The immediate issue will be to get the EU speaking with one voice on things like the Middle East, Iran, Russia, North Africa and so on. Brian writes: Thanks again for this, Peter. The plan to give EU Delegations in third countries responsibility for providing consular services in 10 – 15 years seems appropriately modest! The idea of having EU Delegations in certain countries in place of individual embassies and high commissions of each member state has of course often been mooted for years, but it has always run into the problems that (a) the areas where there’s an agreed EU foreign policy are pretty limited still, and (b) in commercial work EU members compete rather than collaborate, and so few member countries would be willing to give up their own separate diplomatic and consular missions. Information work, cultural exchanges, etc., would also be difficult to organise from a single EU mission. And, not least, the major governments of the EU would be reluctant to have to give up the assets of their own experienced diplomatic services in exchange for an EU service of unpredictable quality and ability, which individual capitals would not be able to control, manage or even task, except with difficulty. So I doubt if this is going to happen for the foreseeable future. It is of course taken for granted that the Eurosceptic UK doesn’t want it to happen and will do all it can to prevent it. But agreed areas of European foreign policy will increase, whether the UK likes it or not, even though foreign policy is not subject to QMV. There are Europe-wide trade issues, the current problem with Opel for example, where it would be useful to have a common position, and the role of European transnational companies in other parts of the world. The Eurosceptics will certainly wish to maintain the influence of their national governments but the 18-month trio presidency of Spain, Belgium and Hungary is an indication of how things are going. The EU can now be represented officially in its own right in international organisations. Brian writes: I don’t for a moment dispute any of what you say, apart from the first sentence which is simply incorrect, certainly as far as the present government and its predecessors over the past 20 or 30 years are concerned: none of us knows what position a future British government will take on this after next year’s elections. I also stress that it’s certainly not just the “Eurosceptics” who will “wish to maintain the influence of their national governments” in international affairs: all but the most marginal EU member states will maintain their national embassies and high commissions for as far ahead as it’s useful to look, except possibly in remote countries where European interests are insignificant, even though I agree that the areas of agreed EU foreign policy will steadily expand, as will the work and role of the new European External Action Service which Lady Ashton now has to set up and manage. For many decades there have already been numerous areas of agreed European foreign policy, including notably trade issues as you say, on many of which the EU’s (and before that the EEC’s) Delegates overseas have taken the lead with third country governments, with (whether or not you believe it!) the active encouragement of successive UK governments. There have been several occasions in the last 20 or 30 years when the idea of a joint EEC or EU embassy in this or that country has been discussed, often prompted by an enthusiastic British government (mainly because it has smelled the possibility of financial savings, as well as at the promptings of a strongly pro-EU or pro-EEC FCO) but it has never so far come to anything for all the obvious reasons. The Lisbon treaty’s dispensations of course entail changes, but they don’t constitute anything like such a sharp break with the past as the media and much of public opinion seem to believe. Previous story A referendum on the UK’s EU membership? Please not yet!